Transport for London has confirmed it is not removing publicly accessible AC rapid charging points in the capital, as Mayor Sadiq Khan announces the 100th unit has gone online today. The new TfL rapid points have been integrated by Zap-Map, including a taxi-only filter. 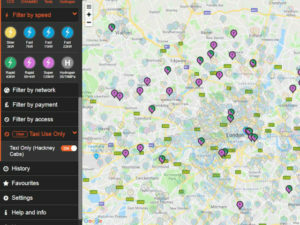 London is said to be home to 10% of the UK’s 118,000 electric vehicles, and already has a widespread network of 2,000 charging points to support them. However, most are slow (3-7kW) chargers, catering for drivers spending several hours parked. By the end of 2018, TfL is aiming to have 150 charging points installed, and for that to double by the 2020. These will be membership-free, accessed by credit or debit cards, and offer top-ups to 80% capacity within an hour for compatible vehicles. However, rumours had been circulating online that the network would not support AC rapid charging. TfL told Fleet World that this is untrue; all publicly accessible points will still support this standard, but the network being installed specifically for taxis won’t, as the vehicles all use DC charging standards. At the time of writing, the Renault Zoe is the only electric car capable of taking a rapid charge at up to 43kW. However, these points can also supply a still quick 22kW charge for the Tesla Model S and Model X, as well as versions of the Zoe without rapid charging. The alternative would be using slower AC chargers, typically at 7kW, which would triple the charging time. Renault’s updated Zoe does not feature DC charging, as had been predicted with the more powerful motor. London’s taxi chargers are a vital part of the city’s air quality plans; there are 51 rapid chargers installed specifically for these vehicles, and as of 1 January all newly licensed taxis must be zero-emission capable, with up to £5,000 offered to drivers decommissioning diesel vehicles. However, TfL’s plans haven’t met with universal approval. Speaking at an event last year, Dr Rebecca Driver, director of Analytically Driven, said the company’s calculations had shown 330 rapid chargers wouldn’t even be enough to support Addison Lee’s fleet, let alone other operators.